Asafa Powell set a world record in the men's 100 meters Tuesday, clocking 9.77 seconds at the Tsiklitiria Super Grand Prix meeting. The Jamaican, who finished fifth in 9.94 at the 2004 Athens Games on the same track, shaved one hundredth of a second off Tim Montgomery's record of 9.78 set in Paris in 2002. Montgomery's record already was at risk because he faces doping charges. 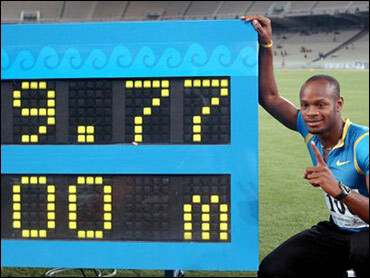 The previous record was 9.79 set by Maurice Greene on the Athens track in 1999. Powell, 22, already had the world's fastest time this year, a run of 9.84 seconds at the Jamaica International Invitational on May 8. He also ran a 9.85 on June 9 in the Czech Republic. His run Tuesday came with a tailwind of 1.6 meters per second, well below the legal limit of 2.0. "I'm very happy that ... I achieved this performance," Powell said after the race at the Olympic Stadium. "I knew I could break the world record and I am very happy I succeeded." It was the first major sporting event in Athens since the Aug. 13-29 Olympics. "It's amazing that, after Maurice Greene, I also achieved a world record in this stadium," Powell said. "If you ask me what I can do more this year, you will just have to wait until the end of this year's season to see." Powell is only the fourth non-American to hold the 100 world record since 1912. Donovan Bailey of Canada (1996), Armin Hary of West Germany (1960) and Percy Williams of Canada (1930) are the others. Powell's run removed controversy from the world record. Montgomery's time of 9.78 could be wiped out if the Court of Arbitration for Sport rules that Montgomery was guilty of doping. Montgomery was charged by the U.S. Anti-Doping Agency with using steroids and other performance-enhancing drugs. Aziz Frater of Ghana finished second to Powell in Tuesday's race in 9.99 and Francis Obikwelu of Jamaica was third in 10.03. In the women's 100 at the Tsiklitiria meet, Jamaica's Sherone Simpson won in 11.5. Arend Watkins of the United States won the men's 110 hurdles in 13.23. Australian world champion Jana Pittman won the women's 400 hurdles in 53.44. She said it was a good result in the lead-up to the world meet this August in Finland. "It was very good training for the world championships in Helsinki," Pittman said. "I am very satisfied that I won the race. I am in very good shape."